Smaller sodas were set to hit New York City eateries tomorrow until a judge stepped in at the eleventh hour to strike down the new regulations. New York Supreme Court Judge Milton Tingling ruled Monday that the city may not enforce the new regulation, CBS New York reported Monday afternoon. The ban, which was set to take place Tuesday, applied to sugary drinks larger than 16 ounces sold at restaurants, fast food establishments, delis, sports venues and movie theaters. The limits do not apply to milk-based and alcoholic beverages sold at these eateries. Also exempt are sugar-sweetened drinks sold at grocery stories and convenience stores. Tingling said loopholes in the regulations defeated the limit's stated purpose. "It is arbitrary and capricious because it applies to some but not all food establishments in the City, it excludes other beverages that have significantly higher concentrations of sugar sweeteners and/or calories on suspect grounds, the loopholes inherent in the Rule, including but not limited to limitations on re-fills, defeat and/or serve to gut the purpose of the Rule," Tingling wrote in his ruling. There was to be a three-month grace period before violators could face $200 fines. "I definitely believe it's going to hurt my business," Mary Cira of Pronto Pizza, told CBS New York ahead of the ban. She said she had to throw out about $1,000 worth of 20-ounce and 2-liter bottles of soda and change her menus. "I have a combo special with a 2-liter soda." Since the sugary drink limits were first proposed last May, health advocates have lauded Mayor Michael Bloomberg for taking a unique step to combat obesity, while consumer groups and advocates for small business owners have accused the mayor of wanting to turn the city into a nanny state. "Certainly the Bloomberg Big Gulp ban is not going to solve obesity, but you know what? It's a good baby step," sugar researcher Dr. Robert Lustig, a professor of medicine at the University of California San Francisco, said on CBS This Morningin February. "It's going in the right direction." Center for Consumer Freedom Senior Research Analyst J. Justin Wilson said in a statement he didn't expect the ban to make a meaningful difference, according to CBS New York. "Personal irresponsibility is what got New Yorkers to put on a few extra pounds. And it's going to take personal responsibility, not a government takeover of our diet, to shed that weight," he said. Critics and the American Beverage Association had taken their challenges to court since the Board of Health approved the mayor's proposal in September. "It would be a tremendous waste of expense, time, and effort for our members to incur all of the harm and costs associated with the ban if this court decides that the ban is illegal," Chong Sik Le, president of the New York Korean-American Grocers Association, said in court papers filed in February. CBS New York reported that some businesses were holding off on making changes to their menus while awaiting a court to challenge or delay the ban. The judge issued his ruling Monday afternoon. 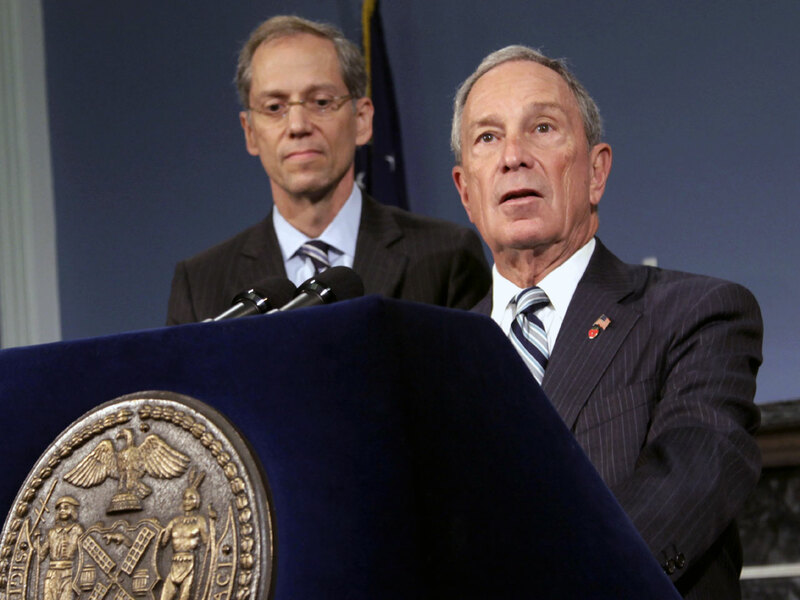 Mayor Bloomberg defended the ban on the March 10th "Face The Nation." "This year, for the first time in the history of the world, more people will die from too much food than from too little food. More people will die from the effects of obesity than from starvation. And we've got to do something about this. This is going to bankrupt the country. Our medical system cannot handle it," he said. "We've just got to do something. And all we're doing in New York is reminding you that it's not in your interest to have too many empty calories," he added. One day ahead of the rules going into effect, the mayor's office had also released a study that found nine out of 10 of the New York City neighborhoods with the highest obesity rates also were neighborhoods with the highest rates of sugary drink consumption. City officials said the new data is the latest evidence that sugary drinks are harming New Yorkers' health. "Reducing sugary drink consumption is critical to reducing obesity and obesity-related illnesses, which kill more people in New York City than anything except smoking. This is what the portion cap on sugary drinks is all about," city Health Commissioner Thomas Farley said in a statement. The mayor also held a Monday evening press conference where he defended the sugary drink limits, noting their was initial controversy surrounding some of his earlier health campaigns like banning smoking in workplaces or banning trans fats. "It would be irresponsible not to do everything we can to try and save lives," he said. Bloomberg also expressed confidence that the ruling would be turned over on appeal and that a judge would eventually rule the city Board of Health was within its legal limits. "There are many instances where a lower court decision has gone against us and been reversed," he said.